I want to share a story of how the energy of aware, loving people can be very attractive to others, even non-human others! Last month I gave a Mindfulness Retreat in Maui. I had a lovely group of folks from all over. On the second day of our retreat, after we had been diligently practicing mindfulness of thoughts, feelings, the body, walking, and eating, we went out for a mindfulness swimming activity. I took everybody to a beautiful beach that was supposed to have great snorkeling and we got in the water…. We all swam out a ways; my group was swimming behind me and I was floating above a turtle, who was just sitting on the ocean floor about 25 feet below me. I was thinking he was so beautiful, and sending him love, and saying in my mind ‘oh I wish you would come up here and visit me’. 10 seconds later he just started floating up, just levitating up, not swimming, not moving his little fins, but just rose straight up and ended up right beside me all of about 6 inches from my face with his face. We just gazed into each others eyes for the longest time, all the while my group was in awe watching, and then he stuck his head out of the water, and I did too, and we gazed into each others eyes above the water! This went on for some time, and we were so close I was having to back-peddle to not bump right into him. Finally he swam very slowly and I swam with him for some time. It just filled me with bliss, with love, with wonder! 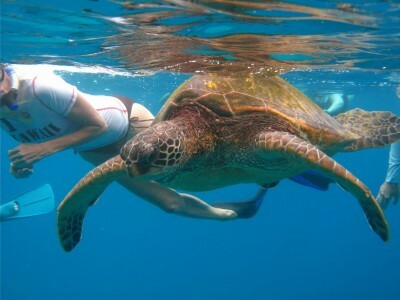 connecting with a sea turtle..